MailWasher is your e-mail inbox solution, preview your email before you download it, plus delete and bounce emails back to the sender as if you didn\'t exist - great for privacy as the sender will receive an email to say the address was unknown. 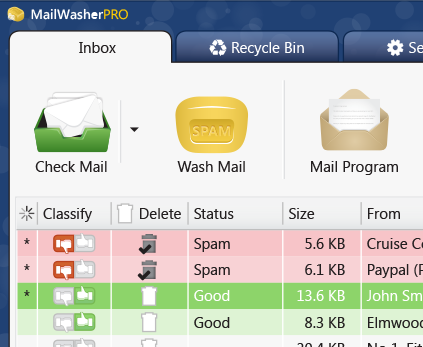 MailWasher is your e-mail inbox solution. Not only does it allow you to preview multiple accounts and all aspects of your emails before you download them, it also allows you to delete, and bounce emails back to the originator as if you didn\'t exist - great for privacy as the sender will receive an email to say the address was unknown � just like a returned email. Using this you will see a large reduction in the amount of spam and unwanted email you receive over time. Another feature is heuristic checking, which helps identify and mark emails as normal, virus, possibly virus, possibly spam, probably spam, chain letter, and blacklisted so you can deal with the emails as you wish. Other features are blacklist (which you can add to manually or automatically, and never hear from that person or spammer again), easy to use customisable filters and advanced use of regular expressions for filtering emails, use of MAPS RBL to identify spammers, multiple accounts, visual and auditory notification of new emails, heuristic checking to detect viruses and spam, minimization to system tray and much more. It\'s fast, free, and very sophisticated and the uncluttered interface makes it extremely simple to use. Comprehensive online help is available on the website. Compatible with POP3 servers. This is a full version with no restrictions, but donations are gladly accepted. Check out the website www.mailwasher.net if you need to know more and for a screenshot. SpamAssassin has been ported for Windows by JAM Software. In combination with an MTA (e.g. Hamster or MS Exchange) it`s a very powerful anti-spam solution.